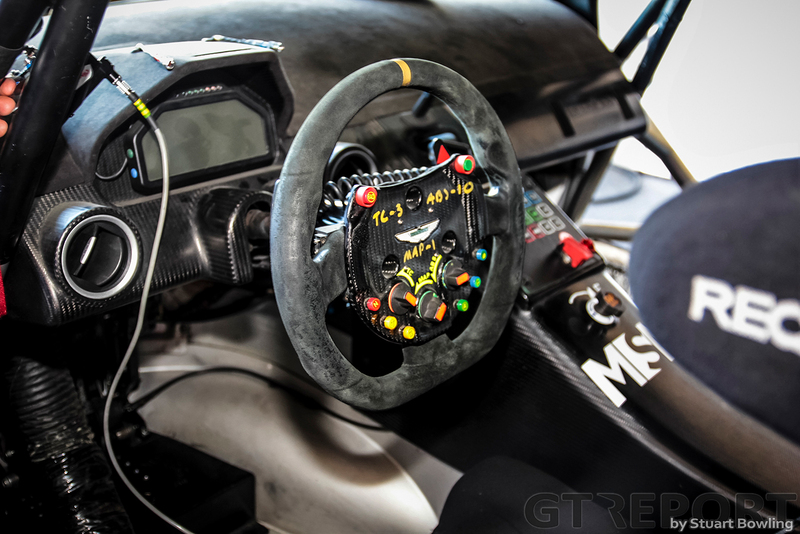 A long, long time ago, in a garage in Banbury, Oxfordshire, a group of engineers from Prodrive designed and put together Aston Martin’s second iteration of GT3 car: the Vantage GT3. Its predecessor, the DBRS9, was one of the first GT3 cars to exist, and ended up being a rather long tenured model (2007-2011). So it comes as little surprise that for a company as small and financially tumultuous as Aston Martin; the V12 Vantage would also go on to fly the brand’s flag for many years despite the GT3 game progressing at an alarming pace. 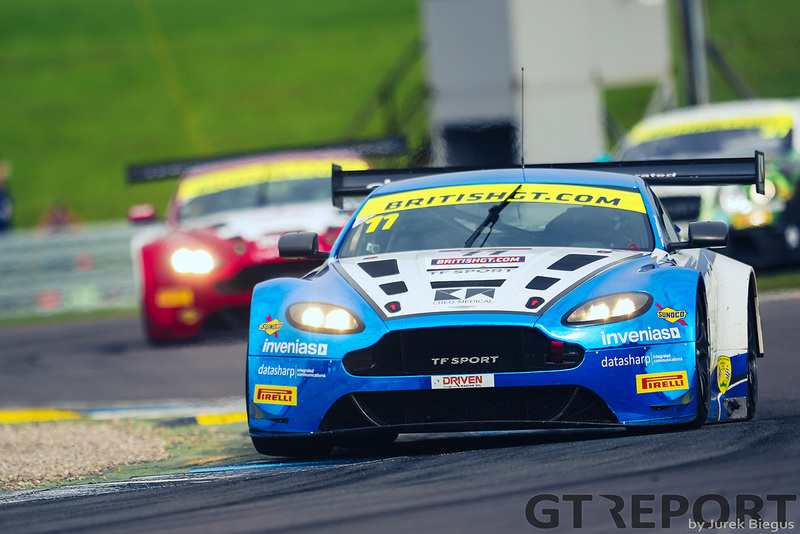 Since its debut back in 2012, the GT3 game has moved on leaps and bounds and the Vantage remains somewhat of a relic when compared against the latest crop of cars with their complex aerodynamics, minimal road car influence and increased operational costs. Further compounding the deficit; the Vantage GT3 program has also always played poor sibling to Aston’s GTE effort–with most development money going to the factory World Endurance Championship cars and trickling out into GT3 package later. 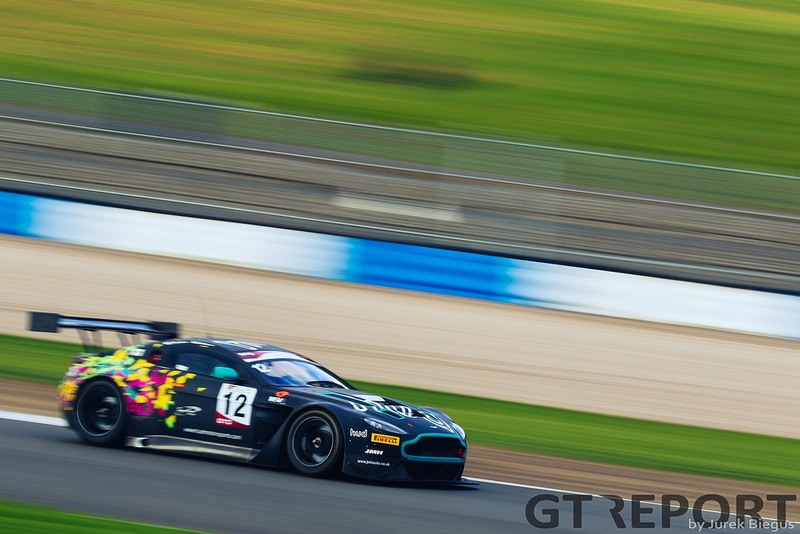 However, it speaks volumes for the V12 Vantage GT3 package that in spite of it going into the 2018 GT3 racing season as easily the most dated modern car, it still holds favour with multiple operators–particularly Pro-Am teams as amateurs still find it relatively easy to extract pace from. Testament to this is the news of at least one Vantage doing the full Blancpain GT Series Endurance Cup. 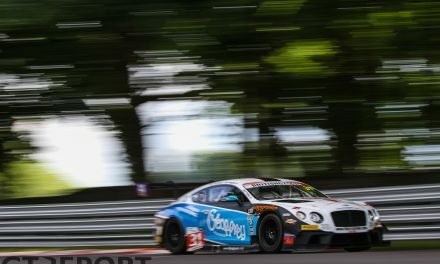 That it still has life in the cutthroat world of Blancpain GT stems from the car’s somewhat simplistic dynamics and the athleticism of its V12 engine which has allowed it to still keep pace relative to the newer machinery. In fact, the Vantage comes from a time when GT3 cars were genuinely built for customers–not Pro efforts–although a few factory-funded trips to the Nürburgring 24 Hours has helped the car build a strong fanbase, not at least for its amazing engine note. Given its rather small proportions, the Vantage is quite a lithe looking piece of kit (although one that has begun showing its age). The Vantage road car has been around since 2006, so it was already 6 years old when the GT3 came to be. 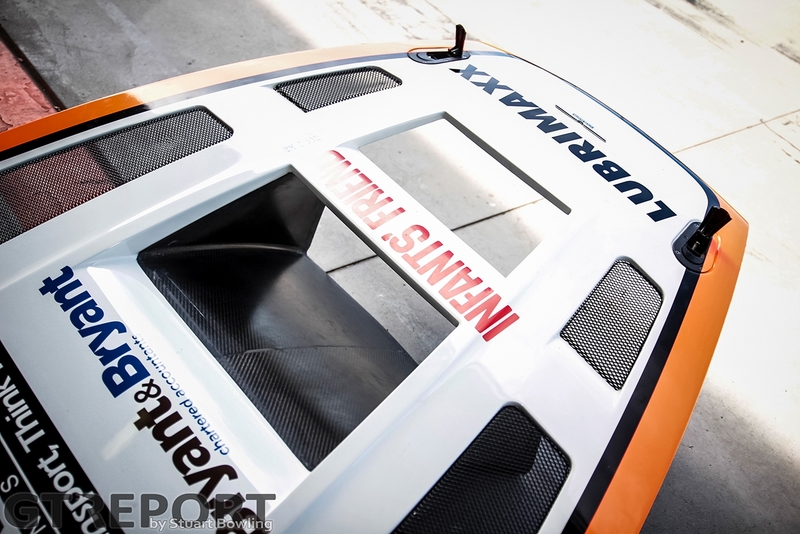 The Vantage GT3 starts life from a road car shell. Like many famous racing Astons before it (namely the famed DBR9 GT1), Prodrive builds the Vantage GT3 using an Aston Martin VH series bonded aluminium chassis. As with most other GT3 cars, the chassis rails, suspension turrets, firewall, door sills and most of the floor pan are left intact. 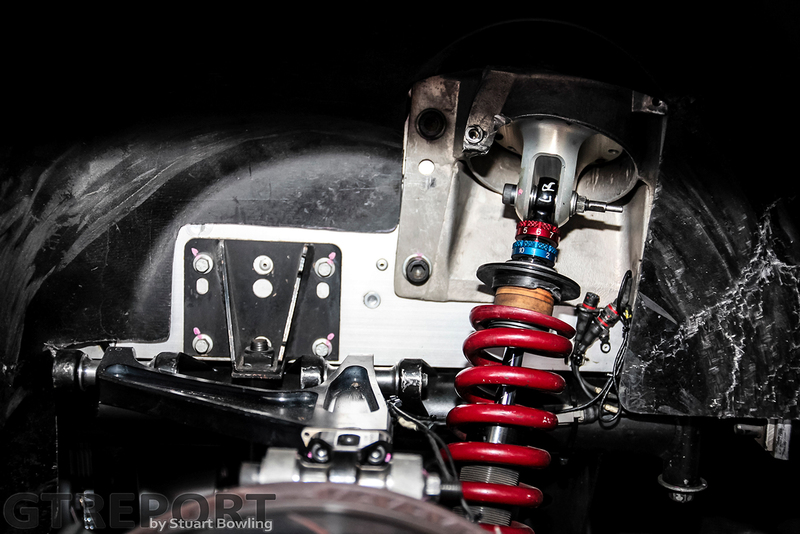 Being a traditional RWD sports car, not many changes are required save for a sub-frame which supports the race-specific transaxle-mounted gearbox. 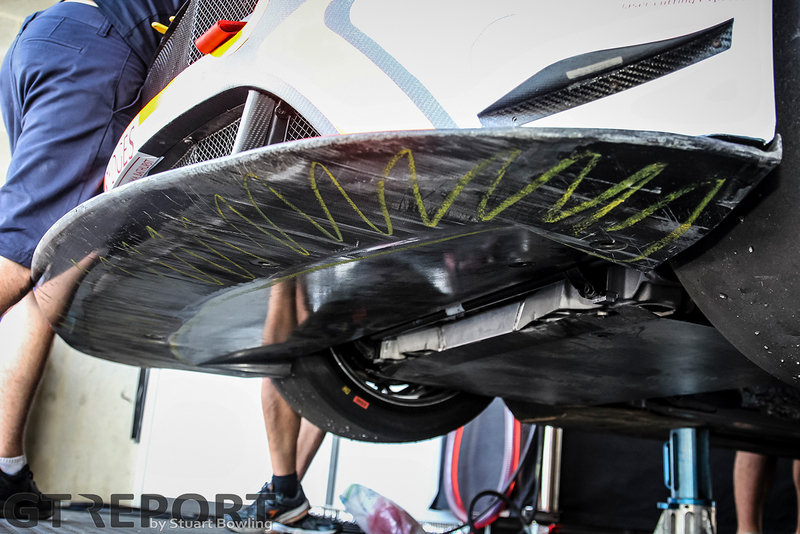 Most of the road car’s external body panels are stripped off and replaced by racing-specific carbon fibre items. Only the aluminium roof is retained. This new bodywork gives the GT3 a much wider stance, with many of the wheel arches flared out to cover some wide racing tyres. At the front, the nose of the car retains its characteristic Aston grille on a full-carbon bumper. The ends of which flare out and feature extensive cut-away sections just behind the wheel. The bonnet retains its trademark Vantage air vents, but is now made in full-carbon. It has additional vents added for race-grade cooling requirements such as radiator optimisation and cockpit ventilation. To stiffen the chassis for racing as well as provide driver safety, an FIA-rated steel roll cage is welded into the shell. 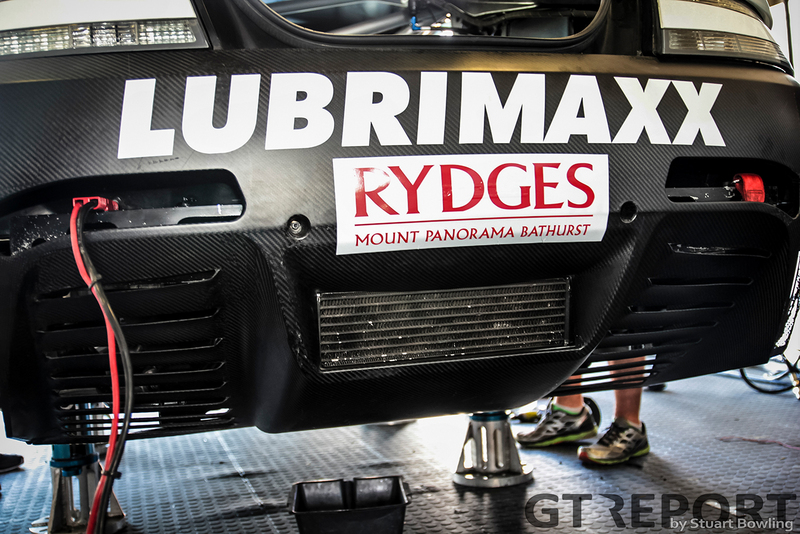 After all the bodywork and equipment changes, the complete car weighs in at 1250 kilogram. The Vantage GT3 keeps itself planted to the asphalt on 300/679 18” tyres up front and 310/705 18” on the rear. These are fitted to 10-spoke 18” rims from TWS-Forged, a Japanese company who is an official partner to Aston Martin Racing. 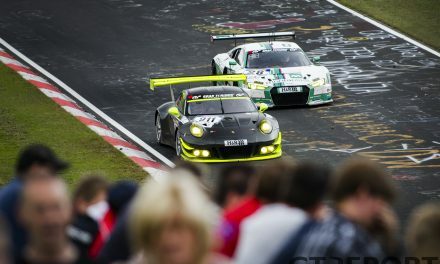 As per all other GT3 cars, these use a centre-lock hub for fast tyre changes during endurance races–with the upright and hub assembly coming from the GTE model of the same car. 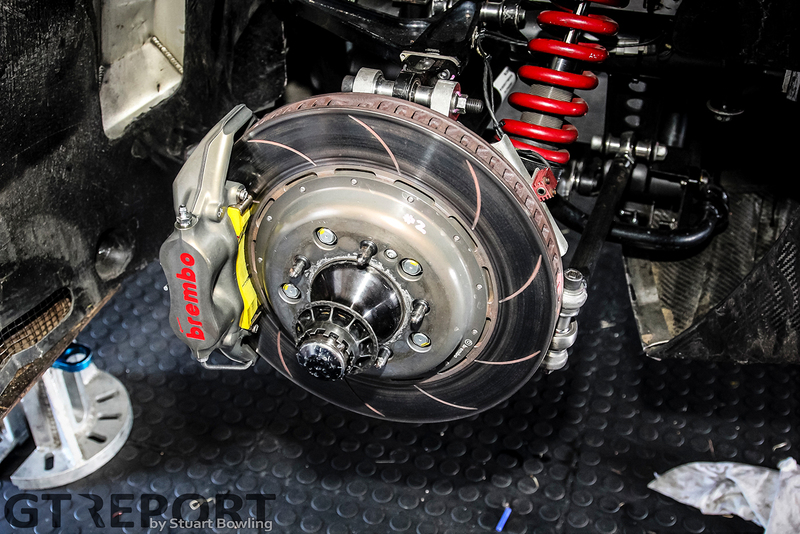 Bringing the Vantage GT3 to a fast halt are Brembo brake sets, front and rear. The front end using six-piston calipers and the rear using four-piston calipers. These are mated to Brembo steel slotted brake discs. The front are fed cooling air from direct ducting originating from the upper intake of car’s front grille, while the rear are not duct fed, instead taking air flow from the underneath of the car. The car’s braking ability is electronically assisted by a Bosch M4 Race ABS system which offers a wide range of adjustability to dictate its influence, with adjustment at the driver’s fingertips courtesy of dials on the steering wheel. As with the GTE car, extracting the most of the Vantage GT3’s road holding abilities are a set of Bilstein four-way adjustable dampers, paired to double wishbone suspension in uniball bearings. 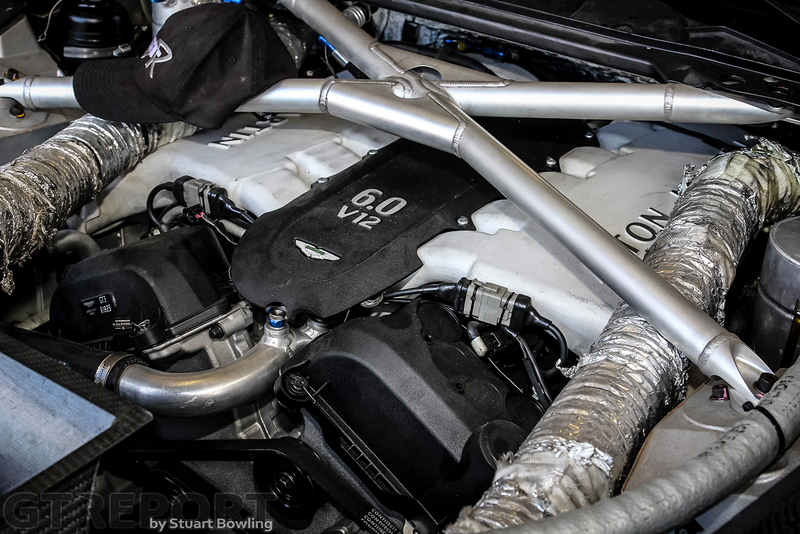 The Aston Martin’s engine bay is dominated by the engine itself. A 6-litre Aston Martin V12 capable of around 600hp and around 700nm of torque is somehow shoehorned into the tight confines of the Vantage’s frame. Even more impressively, Prodrive also managed to make it sit lower down and further back than the same unit in the road car for optimal weight distribution. Aiding this is the adoption of a dry-sump oil system which reduces the total engine height. 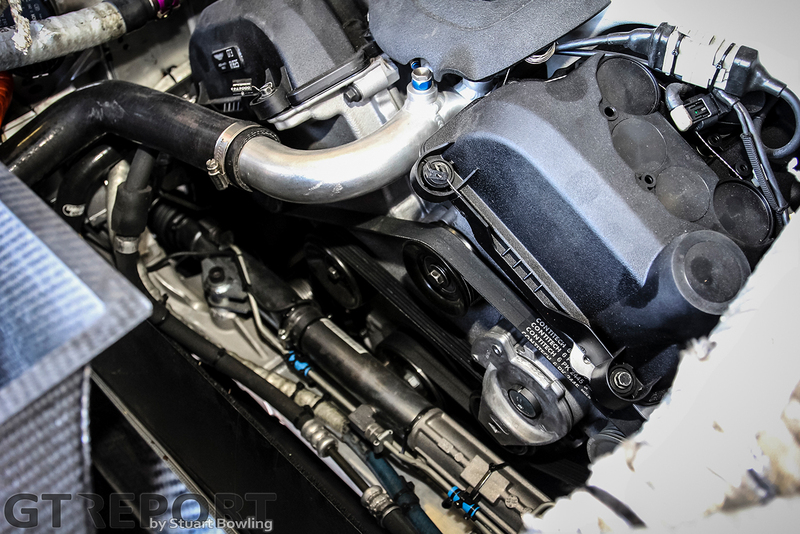 With the lower engine, a racing specific ‘X’ style stiffening brace an easily be installed within the engine bay for improved frontal rigidity. The repositioning of the motor allows for more space for cooling, with an angled racing radiator assembly installed within a carbon tunnel at the front of the engine bay. With the bonnet closed, a complete tunnel for cooling airflow is formed, allowing for optimal radiator performance. In spite of these changes, the Aston’s glorious howling V12 soundtrack is retained, albeit a little muted courtesy of the exhaust system. 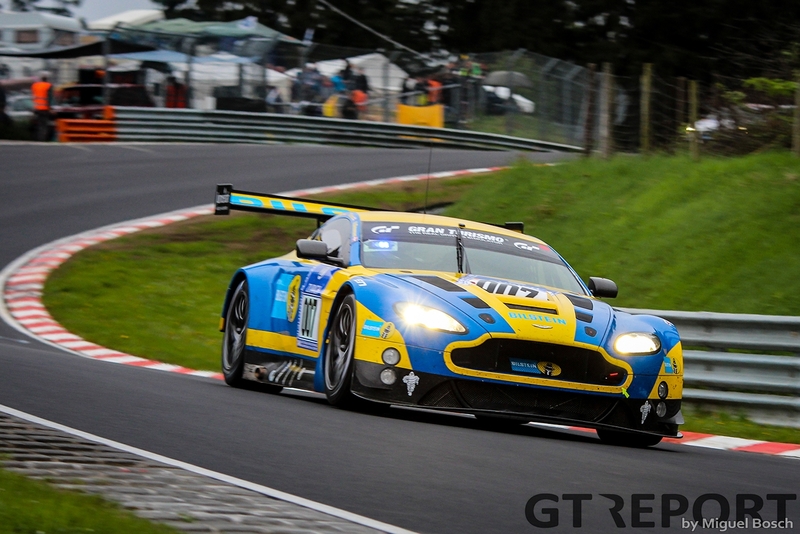 Many regard the Vantage as being the best sounding GT3 car of the lot! All motor power runs through a carbon prop shaft to an Xtrac six-speed sequential racing transmission, which is mounted to the rear axle to improve the cars weight bias (it is very close to 50:50). This is a paddle shift operated, semi-auto unit controlled by paddles attached to the steering wheel. The massive and distinctive Aston Martin front grille is charged with feeding air to almost all parts of the car. The topmost section feeds an oil cooler and front brake ducts. The lower section feeds the engine radiator, as well as the engine air intake which is fed through pod filters located under the headlights. Being one the oldest operating models of GT3 cars, the Vantage GT3 is not as tricked out aerodynamically as many newer offerings. This has played to the strength of Aston Martin’s customer sports program, as many gentleman drivers still favour the type due to its relatively easy drivability. The very front of the car sports a large full carbon splitter with a concave lower profile. This juts out ahead of the car, providing a shelf on which to trap low speed, high pressure air to push the car down to the track. Air flowing underneath the splitter’s lip is quickly expanded by a small diffuser section just before the front axle line. 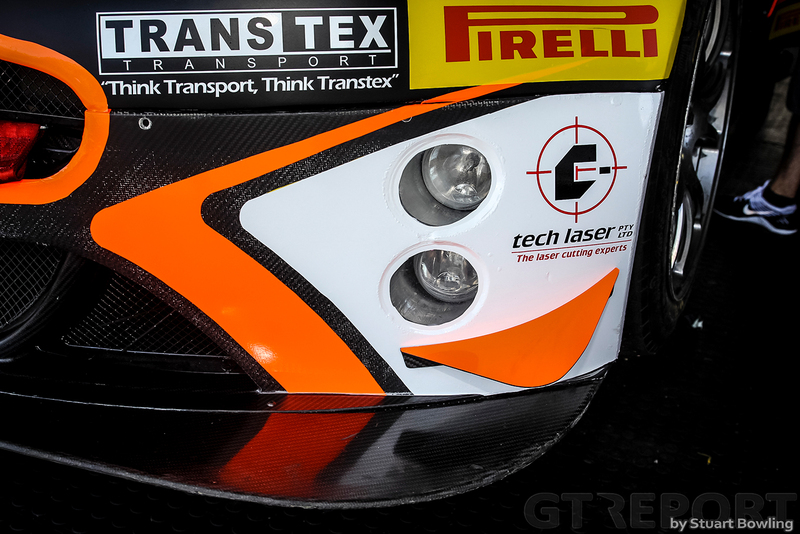 Besides a flat pan that bolts to the bottom of the engine bay, there is no flat floor beyond this–a real sign of the car’s 2012 GT3 vintage–and as a result, the Vantage GT3 also has no rear diffuser. 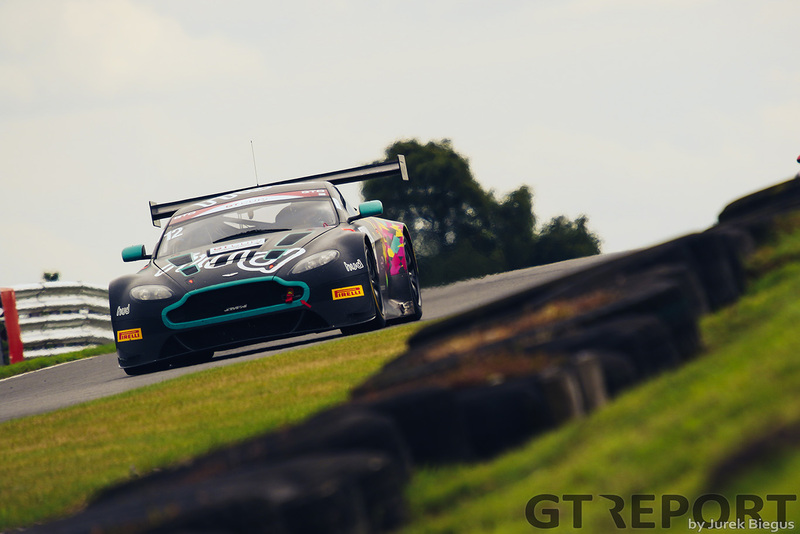 This non-reliance on aerodynamics for grip can be afforded courtesy of GT3’s Balance of Performance (BoP) which allows the Aston to make up any lap deficit created by reduced grip by giving it more power on straight roads, which its pre-BoP adjusted 600hp ceiling allows. That’s not to say careful aero attention hasn’t been paid to other areas of the car. Up front, two small dive planes are added to the cars corners to provide some extra push down to the road, while at the rear, a ‘pseudo’ diffuser removes turbulent air from under the car and a full width, large single chord rear wing provides plenty of push down through to the rear tyres. The Vantage GT3 also doesn’t feature large pronounced side skirts either. Typically, these prevent air from the side of the car spilling through to the underside and disrupting flow, however without a flat floor the requirement for clear separation is not critical. They do, however, house the car’s exhaust system. Behind the flared front wheels are some very large ‘cut-away’ openings that allow significant volumes of air to escape the wheel arches and flow down the side of the car. The Vantage GT3 forgoes its road-going siblings opulent British interior fittings for a much more Spartan fit-out. The interior is mostly a sea of bare metal, graced with the occasional carbon fibre panel or exposed wiring loom. The dashboard is replaced whole sale by a carbon item, with a dash of Alcantara up top to give it a slightly more luxury feel. The centre console is also in carbon, and topped with a simple-to-use flat panel with a number of the cars controls and switches. All other controls are located on the full carbon, flat bottomed steering wheel which looks very simple compared to the fancy equipment on newer cars! These include buttons for lights, speed limiters, radio and neutral gear, as well as dials for the fuel maps, traction control influence, and ABS influence. Behind the wheel grip are the paddle shifters for easy-to-access gear changes. 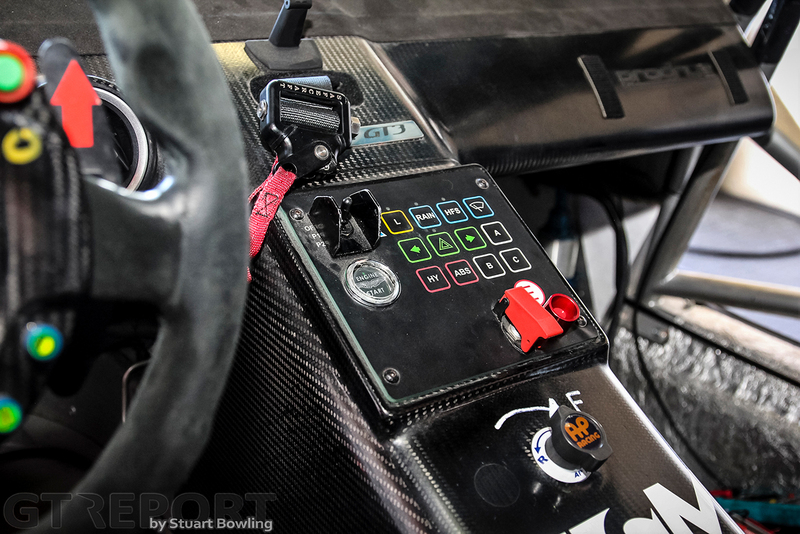 Feet controls are all mounted to an adjustable pedal box which allows for fast adjustment when swapping drivers. 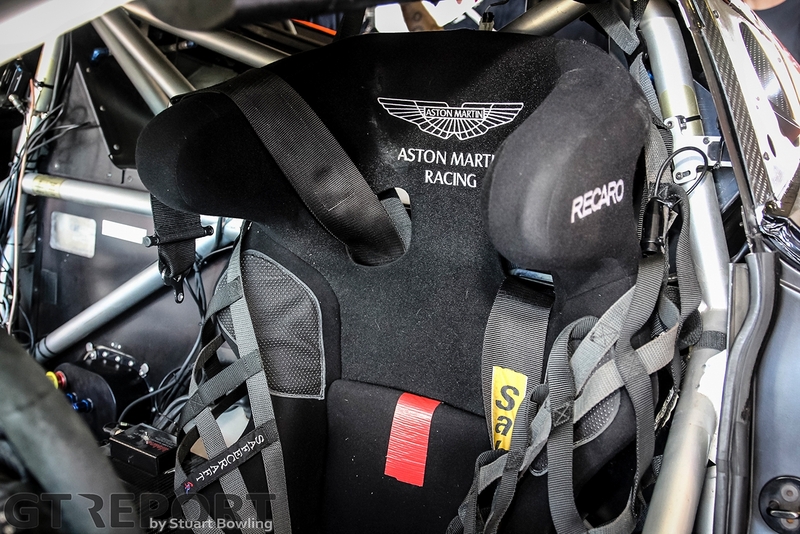 The drivers themselves are strapped to a Recaro race seat with 6 point harness, and protected by nets installed on both sides per the latest regulations. Nestled in the cabin behind the driver is an FIA grade 114 litre ATL fuel cell with bladder. After a 12 year tenure, the Vantage is finally being replaced with a new model powered by an AMG-sourced turbo V8 engine, and with it come new racing versions. Due to the small size of the brand, Aston has opted to first develop the GTE version of the new car for the 2018 WEC season, with the view of trickling down technology and lessons learnt from a year of racing into the customer-focused Vantage GT3 which will be released in 2019. 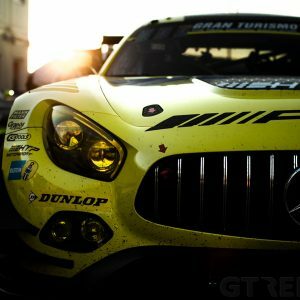 Sadly, it appears the days of the Aston V12 are coming to a close as the new car will feature the AMG V8. 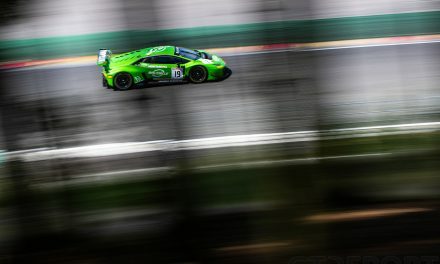 This comes at a unique time for the British GT3 contingent, with Bentley debuting a new model this year and McLaren joining Aston with a new car in 2019. 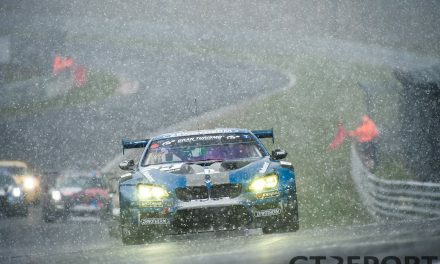 The 2019 British GT Championship will be most interesting! 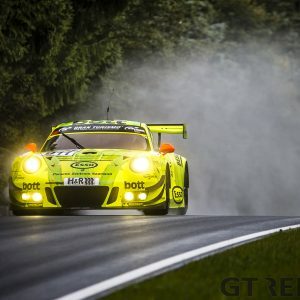 Given the advance in the technicality of GT3 cars since the FIA’s 2016 GT3 regulations came into play, it will be interesting to see how different the next generation of Aston GT3 will be from the current package–with aerodynamics and an emphasis on pure racing car tech now being the status quo among the big players. 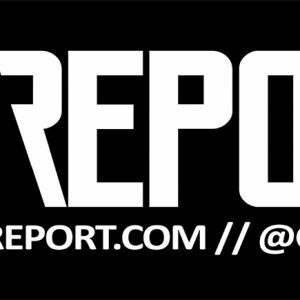 Regardless, if the brand’s tradition is kept up, it is very likely we will see Aston Martin line up their new car for a shot at the big boys in events such as the Nürburgring 24 Hours and other prestigious endurance races.